Coverage: 100 to 120 when applied on normal masonry surface by brush. Thinning: Upto 20% By Volume For Brush And Roller And 30% For Spray Application Using Clean Soft Water. 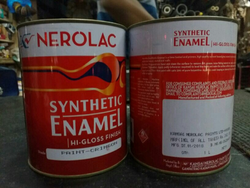 Enriched by our vast industrial experience in this business, we are involved in offering Nerolac Enamel Paint. Coverage (Sq. feet/Litre): 150 - 170 sq.ft./ ltr / coat when applied on a smooth, non-adsorbent surface by brush. Thinning: Upto 30% by volume using Nerolac General Purpose Thinner. Drying Time: 1 - 2 hrs. We are successfully engaged in providing a wide gamut of Nerolac Synthetic Enamel Paint. Coverage 150 - 170 sq.ft./ ltr / coat when applied on a smooth, non-adsorbent surface by brush.